Ernest Hagler, entrepreneur and founder of American Canvas Company, passed away July 29, 2018, in Denver. Rabbi Saul Rosenthal officiated at the Aug. 1 graveside service at Mt. Nebo Cemetery. Feldman Mortuary made the arrangements. 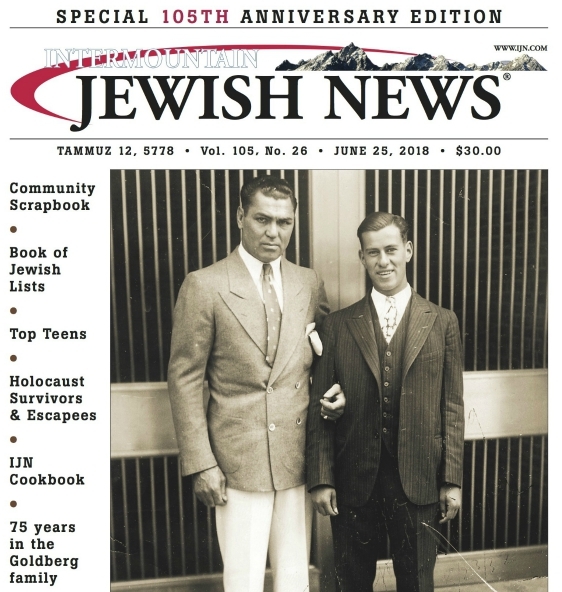 “Ernest was a quintessential eldest brother who fiercely loved his extended family and, consistent with Jewish values, lived an ethical and full life,” his loved ones said. Mr. Hagler was born Aug. 23, 1921, in Denver. A graduate of East High, he received a BS in chemistry from CU where he lettered on the tennis team. During WW II, he worked on LSMs, amphibious assault ships, for the US Navy. Mr. Hagler married Norma Mathless on Oct. 15, 1944. They were married almost 60 years before she passed away in 2003. Founder of American Canvas Company, he also acquired, grew and led the Denver Tent Company. He sold Denver Tent and retired in 1994. Mr. Hagler received the Bruce Wodetzki Memorial Award for Leadership from the International Fabrics Assn. International, which also awarded him the Distinguished Service Award. He volunteered for the Legal Aid Foundation for over a decade. Mr. Hagler is survived by his brother Dr. Louis Hagler of Berkeley; children Jim (Vivien) Hagler of Englewood, Robin (Neil) Kramer of Los Angles and David (Vilma Cadag) Hagler, also of LA; grandchildren Max (Elin) Hagler, Ari (Eliana) Hagler, Leah (Joe) Klocek, Benjamin (Sarah Gibson Tuttle) Kramer, Daniel Kramer and Gabriel (Giulia) Kramer; and great-grandchildren Nadia, Asher, Dina, Nathan and Noah June. Contributions may be made to the Legal Aid Foundation, Southern Poverty Law Center or charity of choice.